Google Apps includes dozens of critical security features specifically designed to keep your data safe, secure and in your control. Your data belongs to you, and Apps tools enable you to control it, including who you share it with and how you share it. Our data center network provides exceptional security and guarantees* reliable access to your data, 24x7x365.25 (that's right: no rest, even on leap years). While you work, all your critical data is automatically backed up on Google servers. So when accidents happen - if your computer crashes or gets stolen - you can be up and running again in seconds. When you put your data in Google Apps, you still own it, and it says just that in our contracts. Apps' powerful, easy-to-use tools help administrators manage things like users, documents and services, and keep track of usage and data via dashboards. 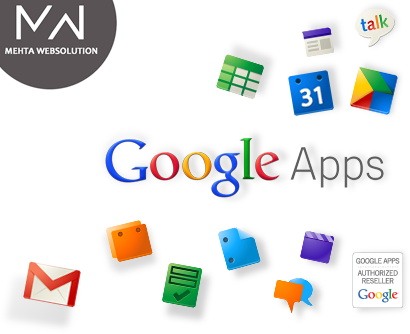 With Google Apps, all your work is automatically saved in the cloud. You'll have access to your email, calendar, documents, and sites and be able to work securely, no matter where you are in the world and what device you're on. For your business, this means every employee and everyone you work with can be productive from anywhere, using any device with an Internet connection. Access your work from any device with a web browser - your computer, phone or tablet - and stay productive even when you're away from the office. Need to attend a meeting from your kid's soccer game? Edit a spreadsheet while at the airport waiting for a flight? Respond to an email from a hotel business center computer? Google Apps makes it easy to stay connected to projects you're working on and the people you work with, no matter where you are or what device you're using. Google applications come pre-installed on most Android devices. Just sign in to your Android phone with your Google Apps username and password, and your email, calendar and contacts will automatically be synced on the go, and you can use Google Talk to IM or video chat from your phone. Administrators can also choose mobile device management policies designed to keep your business information secure. These policies include the ability remotely wipe data from lost or stolen devices, require a device password, set password strength requirements, and more. Gmail, Google Calendar and Google Docs are available as streamlined mobile web experiences. These web apps were specifically designed to work on devices with smaller screens, like phones and tablets, and to perform well even with slower data connectivity typical of mobile devices. Bookmark google.com/m from your phone's browser and add a shortcut to your homescreen for easy access. With Google Docs, just share with a couple of clicks and every member of your team has access to the right version of any document, spreadsheet or presentation. Everyone can jump in and make edits at the same time. No more back-and-forth email attachments and versions that you can't keep track of. Moving to Google Apps helps reduce both your company's overall expenses and its environmental impact. Apps is powered by Google's energy-efficient data centers, so it's less energy and carbon-intensive than on-premise servers.